What makes us human, besides our biology? There would be numerous answers to this question, all of them right in their own way – the fact that we can empathise with others; that we possess spiritual intelligence; our ability to process the world and make sense of it through investigation and research; and of course, our relentless ambition. But perhaps the most endearing quality that makes us human is the need to communicate our thoughts and feelings – to be understood by and understand each other. Speech and hearing are two faculties that are vital for self-expression and interpersonal communication. Most of us can hear the sounds of the world around us – the chirping of birds, a particular piece of music, comforting words of a loved one – and voice our fears, anxieties and joys to people. What about those who cannot hear or speak, though? In Nagpur, Maharashtra, an Akshaya Patra beneficiary school – the Deaf and Dumb Industrial Institute – situated in the Shankar Nagar locality, is a little world in itself. A cloak of quietness hangs over the school. This is the self-contained world of deaf and mute children and youngsters. 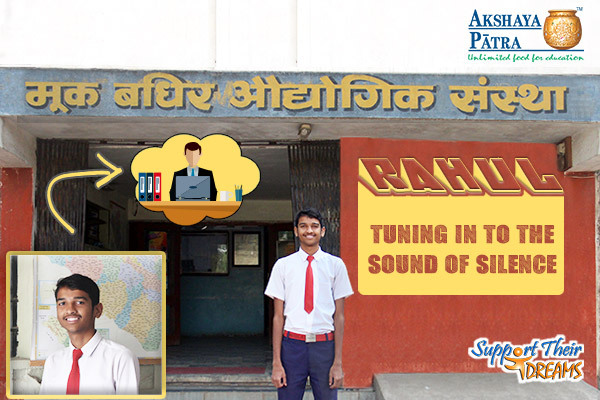 Here, we met Rahul Buade, a Std VIII student studying in the school, who greeted us with a bright smile. He hails from Betul in Madhya Pradesh. His parents are farmers and he also has two brothers, both of whom can hear and speak, unlike him. His teachers facilitated our interaction with him by acting as interpreters, using sign language. We were extremely surprised to know that Rahul is 18 years old. Generally, a student of Std VIII is around 13 years of age. His teachers told us that the reason for that is that most parents aren’t aware of special schools for the deaf and mute. They enroll them in regular schools, due to which their education suffers. When they arrive in a school like the Deaf and Dumb Industrial Institute, they need to be taught everything from scratch, so that the adequate educational groundwork is laid. Therefore, children much older than the average age limit for a particular class can be found in various classes in such schools. Does he go home often? How does he communicate with his parents? Rahul’s teacher Sudha Pathadkar says that when students at their school have a message for their parents, they convey it to their teachers, who then pass it on to them. The children also like school better because of the sense of belonging they feel there, with people who can understand them – their language, the challenges they face, the joys they share. The dedication of the teachers, their patience, sincerity and affection too impressed us immensely. In fact, the students are so attached to their teachers that ex-students often come to school with their marital problems, which the teachers mediate in to resolve. Akshaya Patra’s meals are served every day at school and Rahul is quite fond of them. “I like all the dishes served by the Foundation – subzi, dal and my favourite, shira (a sweet dish made using semolina), served on Saturdays,” he told us. He added that he liked Akshaya Patra’s food as much as home-cooked food and better than the meals served at the hostel he stays at. The meals ensure that the students, especially the ones who stay in hostels, get a tasty, healthy meal at least once a day. The teachers at the school too were appreciative of Akshaya Patra’s Mid-Day Meal Programme, which was launched in Nagpur in 2016. This positive feedback from students and teachers is what has sustained and boosted the Foundation’s Mid-Day Meal Programme throughout the years. We wish Rahul the very best in life and hope he fulfills his wishes and lives a full life, despite the challenges he faces.